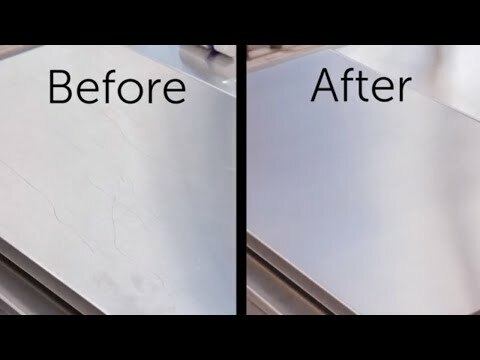 Easily restore and maintain your stainless steel with this easy to use Scratch-B-Gone Homeowners Scratch Remover Kit. Scratch-B-Gone removes even the toughest scratches from stainless steel. Kit includes several different abrasives, a micro fiber towel, stainless steel test strip, Ultra Shine polishing liquid and written instructions. This product ruined my brand new cooktop. I had a scratch in my brand new cook top that was not deep and it devasted me.. I researched on line what to do and seen this product. I even watched the "how to" video on how to use. I took extreme precaution and used it. My cook top now has scratched from doing it and it looks a different color than the original stainless steel. I'm devastated as my brand new cooktop is ruined and I have to be reminded every time I look at it for the next 10 to 15 years how I tuned it!! I should have left it alone with the scratch!! Please,please do not buy this product! !